Lagos State doctors in the employment of the state government on Friday protested non-payment of their two months’ salaries and non-employment of resident doctors in the state. The doctors in the state controlled by the opposition, All Progressives Congress (APC), under the aegis of the Medical Guild Association, also demanded an end to employment of doctors as casual workers. They equally called for an end to alleged victimisation of doctors. 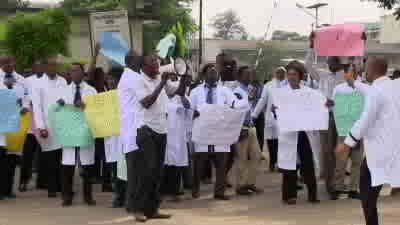 The protest, which took place for about an hour, was held at the Lagos State University Teaching Hospital (LASUTH), Ikeja. The Chairman of the guild, Dr Biyi Ikufo, urged the government to meet the demands of the doctors in order to prevent a strike. “We want the government to pay those withheld salaries of August and September, 2014 and to stop employing doctors as casual workers which it has been doing since 2012. “These workers have no career path; they can be dismissed at the slightest notice, and we want the government to resume training of specialists at LASUTH. They are no longer employing doctors for specialist training; in a few years, there will no longer be specialists to render services to Lagosians,’’ he alleged. The chairman said that the protest was held to bring the issues to the notice of the public in the hope that the government would listen to the doctors. “When we go on strike, the people who suffer are members of the public. That is the why we are bringing this protest to the public space. “We did this in the hope that, this time, things will change,’’ he said. The Vice-Chairman of the guild, Dr Oseni Saliu, said that doctors would continue to fight for their rights, and urged the members of the public to appeal to the government to meet their demands. “We are ready to render services to our people; we are not ready for anybody to subjugate us; we will fight for our rights. “If the government continues to push us and there is a need for an action, we will take the action, “ he said. In his remarks, the President, Association of Resident Doctors, LASUTH chapter, Dr Abdusalam Moruf, said that there had been no residency training programme at the hospital since 2011. “LASUTH has been turned into a general hospital because residents are not being employed, and as such, no one is graduating to become a consultant. There is also a reduction in the specialist manpower of the society. “Diseases such as hypertension, diabetes, stroke and some complex surgeries that need specialist attention will no longer be adequately treated because there are not enough specialists to handle them,’’ he said. Moruf urged the government to employ more resident doctors, pay their salaries, stop victimisation of doctors and stop employing doctors as casual workers.